Creating an easy way for marines to search for custom parts and collaborate. 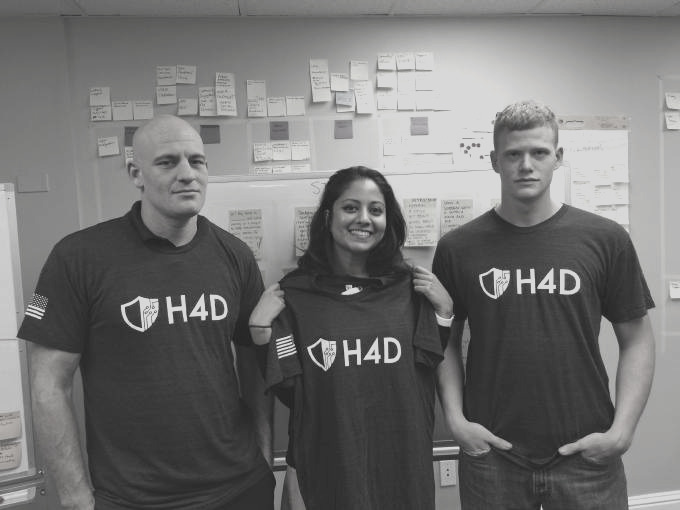 Hacking for Defense (H4D) utilizes lean methodologies to address pressing problems faced by the Department of Defense (DoD), Intelligence Community (IC) and other government agencies. H4D asked us to increase the productivity of Maintenance Battalion Marines responsible for designing custom parts for machines and vehicles. I was a lead designer on one of three teams working on the project. I facilitated design exercises, conducted user interviews, created a prototype, and presented our findings to high ranking military officials. Our goal was to increase the productivity of marine machinists. To tackle this challenge we conducted a five-day Google Ventures Design Sprint. After framing up the problem, and speaking to users and experts, we delivered a desktop prototype that allows marine machinists to search and upload design files for parts through a connected online network. Marines would finally have the ability to share and collaborate when designing custom parts. The marines are currently testing this prototype and the feedback will be used in future iterations. We modeled our process after the Google Ventures Design Sprint. The framework of this design sprint allowed us to generate and test ideas quickly. Furthermore, because this approach heavily focuses on users, we were able to hone in on the ideas that the marines found most valuable—well before the Military made any expensive commitments. The sprint is a five-day process for answering critical business questions through design, prototyping, and testing ideas with users. Careful not to jump to conclusions, we gave the marines the opportunity to share their evaluation of the current process. We asked what areas they found difficult, what areas were working well, and how they felt the process could be improved. We jotted down their impressions on sticky notes to capture opportunities that might be interesting to explore. Next, we elected to complete a Mission Model Canvas in order to help identify potential areas of concern. The Mission Model Canvas is an adaptation of the traditional Lean/Business Model Canvas—tailored for organizations who are not attempting to earn a profit. Rather than focusing on profitability, the Mission Model Canvas allows the organization to define its own success criteria ("mission achievements"). The canvas helped us identify key metrics for success, relevant stakeholders, and the primary beneficiaries. At the end of the day, we synthesized our findings and distilled our observations into a few key insights. Marines have no easy way of knowing if another machinist has already created a file they need. Because files are locally stored, machinists have no way to access the work being completed by other marines. This often led to duplicative work and, ultimately, wasted time and effort. Occasionally, a Marine might reach out to a contact at another facility to see if they had the file available, but this process was haphazard and unpredictable. Machinists don’t know if the files made by others are good or up-to-date. We found that machinists were hesitant to use files created by other marines they didn't personally know because they were worried the files were improperly made or out of date. Even when marines obtained files from trusted sources, they took it on faith that the file would work for them. There was no form of independent quality verification. The files created by marines were machine specific and software specific. Not only were units working in isolation of each other, they were each using different software and machines to build parts. This presented another barrier to sharing work with one another; unless the marines knew what software and machine the blueprint was designed for, the files would be of no use. After talking to users and experts and synthesizing our findings, we refined our problem statement: Create an easy way for machinists to search for parts through a connected system where they can find files that are trustworthy, up-to-date, and compatible with their software and hardware. On day two, we focused on generating potential solutions to the problem. We began by independently investigating how others had tackled similar problems. We each examined two products with unique approaches to search and collaboration: Pinterest and GitHub. Afterwards, we discussed our observations. The marines liked how Pinterest tokenized search terms into organic tags and they also appreciated that the results featured large high-quality images. Furthermore, the marines were drawn to many of Github's project management and team collaboration features, including: version control, embedded documentation, ratings, and comments. At the end of the day, I facilitated a few sketching exercises, including crazy-8s and rapid storyboarding. We were able to generate several great ideas! On Day 3 we reviewed our sketches from Day 2 and dot-voted on the best ideas. Two high-ranked lead marines were given special color dots to decide which ideas would have the most potential. Our team would focus on designing a website prototype that allowed machinists to easily search and download files, to narrow down results with filters, to report issues and to submit changes to existing files. On Day 4 our team focused on designing 4 key features: search, submitting issues, submitting changes, and downloading files. We developed a fuzzy search to allow machinists to search the name, type, or description of the parts they’re looking for. We italicized the the search term in each result to help with scanability. We also added filters for categories, software, and machines because we found that marines had different technical requirements depending on the unit they were working in. Many machinists struggled with blindly trusting work from others; so we added a star rating feature that allowed machinists to star files they found useful and interesting. Submitting issues is a way for machinists to keep track of bugs and problems of their files. If a machinist finds something wrong with a file, they can report an issue to be fixed. If there’s a problem with a file and a machinist has a solution, or an idea for improvement, they can submit their own changes and upload their file for review. To keep track of the history of a file, we gave machinists the ability to view as well as download previous versions in the event that the current version wasn't suitable for download and an older version could be used as a substitute. On Day 5 our team developed a question guide for testing. We were able to initially test one marine remotely through Skype. We asked him first some general questions about how he builds parts and moved into open-ended questions through the prototype. As he was using the prototype he spontaneously said, "This is awesome, When do we get it?!" Based on his response, future results seemed promising, but the marines would continue testing other machinists in coming weeks to discover patterns in behavior in order to iterate and improve the product.